For certain types of woodworking joints such as edge-to-edge joints, miter joints, T-joints, and corner joints, there is hardly a better choice than biscuit joints. Properly-cut biscuit joints are strong and accurate, particularly when cutting slots with a woodworking tool called a biscuit joiner (or plate joiner). A biscuit is a thin, oval-shaped piece of compressed wood shavings, typically made from beech wood. When glued into slots precisely cut by the biscuit cutter, and the moisture from the glue causes the biscuit to swell and tighten the joint. #10 - 3/4" x 2-1/8"
#20 - 1" x 2-3/8"
Biscuit cutters should have the ability to precisely cut all three sizes. As a general rule, try to use the largest size biscuit possible, as this will provide the greatest amount of strength to the joint. In most cases, use #20 biscuits, but when working on narrower material, switch to smaller biscuits where appropriate. The most common type of biscuit joints is edge-to-edge joints. This is often used for gluing up table tops of various width boards of the same thickness, where biscuits are used along the planed long edges of the boards. To glue up a table top of various boards, lay out the boards side-by-side with each board's end grain turned in the opposite direction of that of the previous board. This will help keep the table-top stable when the boards expand or shrink. Once the boards are in the proper positions, use a pencil to make marks across the joints every 4-6". These will be the centerlines for the biscuit slots. Next, separate the boards and adjust your biscuit joiner for the appropriate size of the biscuit. In the case of edge-to-edge joints, you'll most likely use the large #20 size. Placing the guide fence on top of the stock (perpendicular to the edge), align the cutting guide with the pencil mark. Hold the fence in place, start up the saw and once the motor is at full speed, smoothly plunge the blade into the stock until you can't push any farther. Then, retract the blade fully and repeat at the next mark. Once all of the slots have been cut, place a small amount of glue evenly throughout the slots on one edge and insert the biscuits. Then, apply a similar amount of glue into the opposite slots on the other edge and connect the two boards. 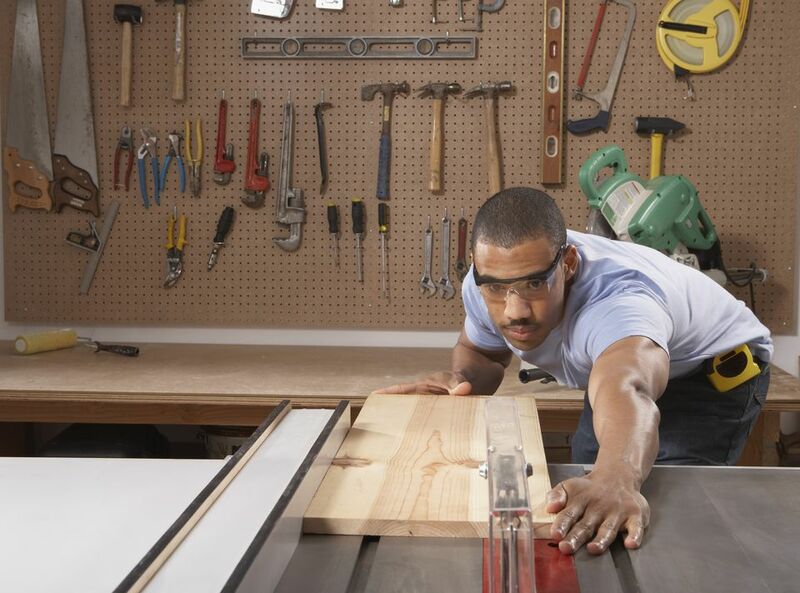 You'll want to quickly glue up each edge of the table top and then clamp the entire assembly. Snug the clamps so that all of the gaps close completely, but be careful to avoid squeezing so hard that any glue in the joints is squeezed out. If any glue does squeeze out of the joints, be sure to wipe it off immediately to avoid affecting the finish later. You can use biscuit joinery for a number of different types of joints. Smaller biscuits work well for strengthening miter joints and corner joints. Biscuits also work well for T-joints, where the end grain of one board is connected to the side of another board.